The open look to the stayers' hurdling division appears to have a more one-sided dimension to it after Thistlecrack continued his rise with a decisive success at Ascot. Having disposed of reigning World Hurdle champion Cole Harden in the Long Distance Hurdle on his previous start at Newbury, the seven-year-old took another step forward in this Grade One. Reve De Sivola, in his bid for a fourth straight success in the race, set what was a decent gallop to ensure the stamina limitations of his rivals would be given a test. After having his attentions switched from chasing for the season, Saphir Du Rheu travelled kindly in the hands of Sam Twiston-Davies as he moved up to join the Nick Williams-trained 10-year-old mid-way around the second circuit before folding tamely rounding the home turn. Richard Johnson threw everything he had at Reve De Sivola, but Tom Scudamore cut an altogether different image aboard the 2-1 favourite as he breezed into the lead over the penultimate flight. Despite producing a less-than-fluent jump at the last, Thistlecrack was not for stopping and cantered to an eight-length success. Thistlecrack is now the outright favourite with all firms for the Ladbrokes World Hurdle at the Cheltenham Festival in March. Tizzard said: "I had it on my mind all summer that if he's not up to World Hurdle class we'd scrap that and go over fences. "We said we'd give him two runs over hurdles to see if he's good enough and we now know what the answer to that is. "He'll run again one more time before Cheltenham, otherwise I'd be left twiddling my thumbs with him for three months. "If you look at him, he looks a magnificent specimen of a chaser, but he is picking up an awful lot of money doing what he is doing. "He just hurdles really accurately but he has got the scope for everything you could possibly want from a horse. "Tom said it felt great and it looked great - he does everything so easily. "When I first had him he was like a 13-year-old with a runny nose. Now he has grown up you could not fault him as a racehorse." Scudamore, was only able to ride at Ascot after a successful careless-riding appeal on Thursday, said: "He gave me a lot of pleasure - it's a very special day. "David Pipe (Scudamore's boss) said to me you can ride Thistlecrack but I had to just clear it with John (White), his owner. "I spoke to him (White) when both horses were going for the race and John was very helpful and gave me his blessing. "I very rarely get off one for David Pipe as he has been very loyal and good to me and it was tough to desert Dynaste on this occasion. "He (Thistlecrack) has done everything that I've asked of him and it was a very impressive performance." Williams was pleased with the performance of Reve De Sivola, but is not keen to renew rivalry with Thistlecrack in the World Hurdle. He said: "I felt he was as well as he could be coming into the race. "We are vulnerable to the up-and-coming youngsters. "He might go for the Cleeve Hurdle but I don't know if I would want to take on Thistlecrack again. 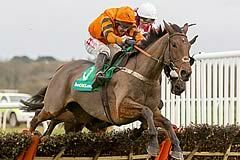 "He has not got a good record in the World Hurdle so I doubt we would go for that, we might just do something different. "I thought he ran his race, though." Saphir Du Rheu failed to land a blow, trailing home fifth, but his rider Sam Twiston-Davies believes he will soon be back to his best. He said: "He had a very hard race in the Hennessy. "He probably just got a little bit tired. "He is a Grade One-winning horse on his day and he will get back to that."